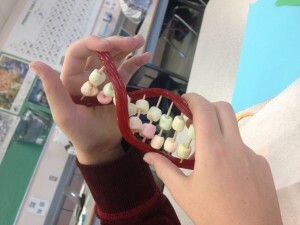 for science we had to create a DNA stem, following the TAC GTA TGA – AT GC -, using coloured marshmallows, liquorice, and toothpicks. Each colour of marshmallow represented a different letter of the combination (T,A,G or C). this project was different way of learning but at the end it made sense. it was nice to have help from Olivia because she told me what to do and I made it, and it was fun but mostly because I ate most of the marshmallows. and they were good!